The Indonesian National Armed Forces (Indonesian: Tentara Nasional Indonesia, TNI); in 2014 comprises approximately 395,500 military personnel including the Army (TNI-AD), Navy (TNI-AL) including the Indonesian Marine Corps (Korps Marinir), and the Air Force (TNI-AU). The Indonesian Armed Forces was formed during the Indonesian National Revolution, when it undertook a guerrilla war along with informal militia. As a result of this, and the need to maintain internal security, the Armed forces including the Army, Navy, and Air Force has been organised along territorial lines, aimed at defeating internal enemies of the state and potential external invaders. Under the 1945 Constitution, all citizens are legally entitled and obliged to defend the nation. Conscription is provided for by law, yet the Forces have been able to maintain mandated strength levels without resorting to a draft. Most enlisted personnel are recruited in their own home regions and generally train and serve most of their time in units nearby. Military spending in the national budget was widely estimated 3% of GDP in 2005, but is supplemented by revenue from many military-run businesses and foundations. The Indonesian armed forces (Military) personnel does not include members of law enforcement and paramilitary personnel such as the Indonesian National Police (Polri) consisting of approximately 590,000+ personnel, BRIMOB of around 42,000+ armed personnel, the Civil Service Police Unit (Municipal police) or Satpol PP, Indonesian College Students' Regiment or Resimen Mahasiswa (Menwa) which is a collegiate military service consisting 26,000 trained personnel, and civil defence personnel (Linmas or Public Protection Service Corps, which replaced the old Hansip in 2014). Before the formation of the Indonesian Republic, the military authority in the Dutch East Indies was held by the Royal Dutch East Indies Army (KNIL). Although the KNIL is not directly responsible for the formation of the future Indonesian armed forces, and mainly took the role of foe during Indonesian National Revolution in 1945 to 1949, the KNIL had also provided military training and infrastructure for some of the future TNI officers. There were military training centres, military schools and academies in the Dutch East Indies. Next to Dutch volunteers and European mercenaries, the KNIL also recruited indigenous, especially Ambonese, Kai Islanders, Timorese, and Minahasan people. In 1940 with the Netherlands under German occupation and the Japanese pressing for access to Dutch East Indies oil supplies, the Dutch had opened up the KNIL to large intakes of previously excluded Javanese. Some of the indigenous soldiers that had enjoyed Dutch KNIL military academy education would later become important TNI officers. For example: Suharto and Nasution. 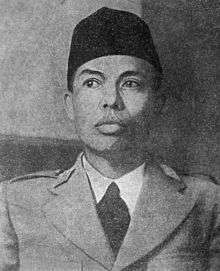 Indonesian nationalism and militarism started to gain momentum and support in World War II during the Japanese occupation of Indonesia. To gain support from the Indonesian people in their war against the Western Allied force, Japan started to encourage and back Indonesian nationalistic movements by providing Indonesian youth with military training and weapons. On 3 October 1943, the Japanese military formed the Indonesian volunteer army called PETA (Pembela Tanah Air – Defenders of the Homeland). The Japanese intended PETA to assist their forces oppose a possible invasion by the Allies. The Japanese military training for Indonesian youth originally was meant to rally the local's support for the Japanese Empire, but later it became the significant resource for the Republic of Indonesia during Indonesian National Revolution in 1945 to 1949. It also led to the formation of the Indonesian national armed force in 1945. The Indonesian armed forces have seen significant action since their establishment in 1945. Their first conflict was the 1945–1949 Indonesian National Revolution, in which the 1945 Battle of Surabaya was especially important. At first, The Indonesian Army started out as BKR (Badan Keamanan Rakjat – People's Security Corps), which was formed in the 3rd PPKI meeting, 29 August 1945; this was an Organisation of People taking up arms in a united force to ensure security remained intact across the newly declared independent Indonesia; it was created more as a civil defence force than an army. The decision to create a "security corps and not an army, was taken to lessen the probability of the allied forces viewing it as an armed revolution and invading in full force. At the capitulation, one of the terms of surrender to the Japanese was to return the Asian domains they had conquered to the previous nation of the Allies, certainly not to liberate them independently. When confrontations became sharp and hostile between Indonesia and the Allied forces, on 5 October 1945 TKR (Tentara Keamanan Rakjat – People's Security Army) was formed; this was a move taken to formalise, unite, and organise the splintered pockets of independent troopers ('laskar') across Indonesia, ensuing a more professional military approach, to contend with the Netherlands and the Allied force invaders. In January 1946, TRI (Tentara Republik Indonesia – Republic of Indonesia Army) was formed, in a further step to professionalise the army and increase its ability to engage systematically. In June 1947 then, TRI changed its name to TNI (Tentara Nasional Indonesia - Indonesian National Army) which is a merger between the TRI with independent troopers paramilitary people's struggle (laskar) across Indonesia. From the 1950s to 1960s the Republic of Indonesia struggled to maintain its unity against local insurgencies and separatist movements in some of its provinces. From 1948 to 1962, the TNI was involved in local warfare in West Java, Aceh, and South Sulawesi against Darul Islam/Tentara Islam Indonesia (DI/TII), a militant movement aimed at establishing an Islamic state in Indonesia. The TNI also helped bring the rebellion of Republic of South Maluku to a close in 1963. Meanwhile, the PRRI/Permesta rebellion holds an essential place in Indonesian military history because it was led by army officers in Sumatra and Sulawesi between 1955 and 1961. From 1961 to 1963, the TNI was involved in the military campaign to incorporate Western New Guinea into Indonesia, which pitted the TNI against Netherlands New Guinea. From 1962 to 1965 TNI fought in the Indonesia-Malaysia Confrontation. The Indonesian killings of 1965–1966 directly involved the armed forces under Lt. General Suharto fighting against the Communist Party of Indonesia. Indonesia developed a good relationship with the Soviet Union in the period of 1961-65. The Soviet Union sold 17 ships to the Indonesian Navy, the largest of which was a Sverdlov class cruiser. The size was 16,640 tons, very big compared to the current Indonesian Sigma class corvette at only 1,600 tons. Indonesia procured 12 Whiskey class submarines plus 2 supporting ships. Indonesia had more than a hundred military aircraft, 20 supersonic MiG-21s, 10 supersonic Mig-19, 49 Mig-17 and 30 MiG-15. The Soviets also supplied Indonesia with 26 Tupolev Tu-16 strategic bombers, though it is not clear what the servicability rate was. During the New Order-era, the Indonesian military enjoyed certain privileges and played a significant role in Indonesian politics. 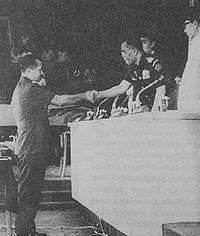 The military involvement in Indonesian politics was formulated in the Dwifungsi (Dual function) doctrine of the Indonesian Armed Forces. 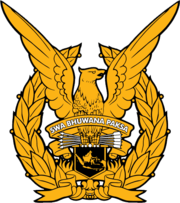 During the New Order-regime the "Tentara Nasional Indonesia" (Indonesian National Army/TNI) changed its name to "Angkatan Bersenjata Republik Indonesia" (Republic of Indonesia Armed Forces/ABRI) and incorporated the POLRI (Indonesian National Police). In 1975, Indonesia invaded East Timor, followed a year afterward by the Insurgency in Aceh, flaring on-and-off from 1976 to 2005. From the 1970s to 1990s the Indonesian military worked hard to suppress these armed insurgency and separatist movements in the provinces of Aceh and East Timor. In 1991 the Santa Cruz Massacre occurred in East Timor, tarnishing the image of the Indonesian military internationally. This incident led the United States to sever its IMET funding, which supported training for the Indonesian military. Also in 1992, each service began to form small female units. These all-female Corps are the Women's Army Corps, the Women's Naval Service, the Air Force Women's Corps, and the Women's Corps of the Police. These were intended to "set to work at places and in functions conform[ing] to their feminine disposition." More specifically, women were assigned to administrative work, teaching English and working to improve health and social conditions of armed forces members and their families. The women police were said to "play an important role in solving problems [of] drug addicts and juvenile delinquents." After the Cold War ended the Indonesian Armed Forces began to take part in United Nations peacekeeping missions. These were usually known as 'Garuda' deployments. 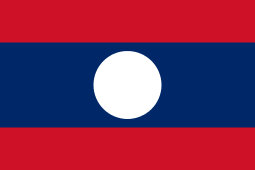 The first was to the United Nations Transitional Authority in Cambodia, quickly followed by a deployment as part of the United Nations Protection Force in Bosnia Herzegovina. 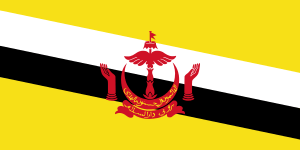 Indonesian troops deployed to both the United Nations Operation in Somalia I and the United Nations Operation in Somalia II. After the fall of Suharto in 1998, the democratic and civil movement grew against the acute military role and involvements in Indonesian politics. As the result, the post-Suharto Indonesian military has undergone certain reformations, such as the revocation of Dwifungsi doctrine and the terminations of military controlled business. The reformation also involved the law enforcement in common civil society, which questioned the position of Indonesian police under the military corps umbrella. These reforms led to the separation of the police force from the military. In 2000, the Indonesian National Police officially regained its independence and now is a separate entity from the military. 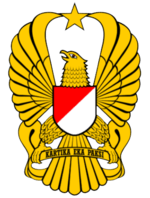 The official name of the Indonesian military also changed from "Angkatan Bersenjata Republik Indonesia" (ABRI) back to "Tentara Nasional Indonesia" (TNI). Indonesian military continue its involvement and contribution in United Nations peacekeeping missions. After 1999, Indonesian troops went to Africa as part of the United Nations Mission in the Democratic Republic of Congo. The TNI has also served with the United Nations Interim Force in Lebanon, UNAMID, UNSMIS, MINUSTAH, UNISFA, UNMISS, UNMIL. Following the 2004 Indian Ocean earthquake, the United States government suspended a spare parts embargo which had been in place for non-lethal equipment and military vehicles, to support the humanitarian effort in the tsunami-devastated regions of Aceh and Nias. Since then, the Indonesian Air Force has signed deals to purchase more C-130 transport aircraft and upgrade the current C-130s in the inventory. On 22 November 2005, the US announced that military ties with Indonesia would be restored in full. The decision had ended the six-year US ban on arms sales. In 2009, all former Indonesian military businesses were to be surrendered to a specialist body. The Indonesian Military Business Management Body (BPBTNI) was established in effect of a stipulation in Law No. 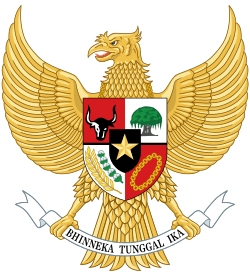 34/2004 on the Indonesian Military (TNI) which was to take over ownership and operation of all businesses owned or run by the TNI by 2009. Unlike the former National Banking Restructuring Agency (BPPN) which burdened the Indonesian state with losses, the BPBTNI would bear all losses alone. From 2010 onwards, military spending in Indonesia was aligned to the Minimum Essential Force (MEF) strategic plan 2010 – 2014 requirements. Under MEF 2010 – 2014 funds of up to Rp150 trillion ($16.41 billion) to spend over five years to procure major weapons systems, Rp50 trillion $5.47 billion) will be used to accelerate achieving the Minimum Essential Force, Rp55 trillion ($6.02 billion) for procurement and Rp45 trillion ($4.92 billion) for maintenance and repair. Subsequent funding would be made available to fund the strategic plans of MEF 2015 - 2019 and MEF 2020 - 2024 to achieve the strategic goal of Minimum Essential Force. During the Suharto era, the military had a "dual function" (dwifungsi in Indonesian) defined as: firstly preservation and enforcement of internal and external security and sovereignty of the State and secondly, as an overseer and arbiter of government policy. This was used to justify substantial military interference in politics. Long-time president Suharto was an army general and was strongly supported by most of the military establishment. Traditionally a significant number of cabinet members had military backgrounds, while active duty and retired military personnel occupied a large number of seats in the legislature. Commanders of the various territorial commands played influential roles in the affairs of their respective regions. 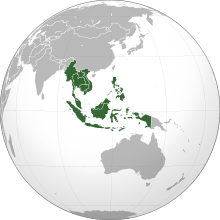 Indonesia has not had a substantial conflict with its neighbours since the 1963–1965 Indonesia-Malaysia Confrontation, known in Indonesia as Konfrontasi with Malaysia. Possible future disputes relating to competing Malaysian-Indonesian South China Sea claims, where Indonesia has large natural gas reserves, concern the Indonesian government. As of 2007, some regional claims with neighbouring Malaysia have led to some minor sabre-rattling by both sides with a stalemate over the sovereignty of Unarang rock and the maritime boundary in the Ambalat oil block in the Celebes Sea. In the post-Suharto period since 1998, civilian and military leaders have been successfully removing the military influence from politics and advocated the structural reform in military body. For example, the military's representation in the House of Representatives was removed, police forces was separated completely from armed force, and an active military officer can't hold ministerial seat at cabinet anymore including at the defence ministry post. It sometimes comes to armed conflicts between the military and the police. The Indonesian military philosophy over-riding defence of the archipelago is summarily civilian-military defence, called "Total People's Defence"- consisting of a three-stage war: a short initial period in which invader would defeat a conventional Indonesian military, a long period of territorial guerrilla war followed by a final stage of expulsion- with military acting as a rallying point for defence from grass-roots village level upwards. The doctrine relies on a close bond between villager and soldier to encourage the support of the entire population and enable the military to manage all war-related resources. The civilian population would provide logistical support, intelligence, and upkeep with some trained to join the guerrilla struggle. The armed forces regularly engage in large-scale community and rural development. The "Armed Forces Enters the Village" (AMD) program, begun in 1983 is held three times annually to organise and assist construction and development of civilian village projects. The current developments in Indonesia's defence policies are framed within the concept of achieving "Minimum Essential Force" or MEF by 2024. This concept of MEF was first articulated in Presidential Decree No. 7/2008 on General Policy Guidelines on State Defence Policy (Peraturan Presiden Republik Indonesia No. 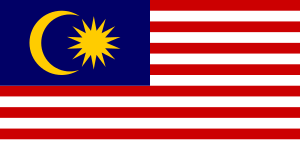 7 Tahun 2008 Tentang Kebijakan Umum Pertahanan Negara) which came into effect on 26 January 2008. MEF is defined as a capability based defence and force level that can guarantee the attainment of immediate strategic defence interests, where the procurement priority is given to the improvement of minimum defence strength and/or the replacement of outdated main weapon systems/equipments. To achieve this aim, MEF had been restructured into a series of 3 strategic programmes with timeframes from 2010 to 2014, 2015 to 2019 and 2020 to 2024 as well as spending of up the 1.5 - 2% of the GDP. The Indonesian armed forces have long been organised around territorial commands. 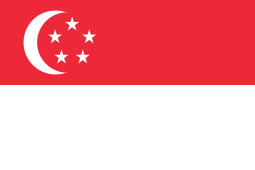 Following independence, seven were established by 1958. No central reserve formation was formed until 1961 (when the 1st Army Corps of the Army General Reserve, "CADUAD", the precursor of today's Kostrad was established). It was only after the attempted coup d'état of 1 October 1965 and General Suharto's rise to the presidency that it became possible to integrate the armed forces and begin to develop a joint operations structure. Following a decision in 1985, major reorganization separated the Ministry of Defense and Security ("HANKAM") from the "ABRI" (Indonesian Armed Forces name during Soeharto's presidential era) headquarters and staff. "HANKAM" was made responsible for planning, acquisition, and management tasks but had no command or control of troop units. The "ABRI" commander in chief retained command and control of all armed forces and continued by tradition to be the senior military officer in the country. Since the separation of the ministry from the armed forces headquarters in 1985, the "HANKAM" staff has been composed largely of retired military personnel. The split provided positions of responsibility for highly qualified but relatively young retired officers of the Generation of 1945 while also opening up high level billets in "ABRI" to younger active-duty officers who had been frustrated by slow rates of promotion. The administrative structure of "HANKAM" consisted of a minister, secretary general, inspector general, three directorates-general and a number of functional centers and institutes. 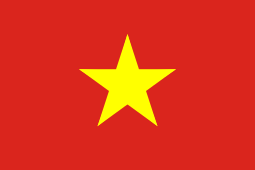 The minister, inspector general, and three directors general were retired senior military officers; the secretary general (who acted as deputy minister) and most functional center chiefs were active-duty military officers. The 1985 reorganisation also made significant changes in the armed forces chain of command. The four multi-service Regional Defense Commands ("Kowilhans") and the National Strategic Command ("Kostranas") were eliminated from the defense structure, establishing the Military Regional Command ("Kodam"), or area command, as the key organisation for strategic, tactical, and territorial operations for all services. The chain of command flowed directly from the "ABRI" commander in chief to the ten "Kodam" commanders, and then to subordinate army territorial commands. The former territorial commands of the air force and navy were eliminated from the structure altogether, with each of those services represented on the "Kodam" staff by a senior liaison officer. The navy and air force territorial commands were replaced by operational commands. The air force formed two Operations Commands ("Ko-Ops") while the navy had its Eastern Fleet and Western Fleet—Armadas. 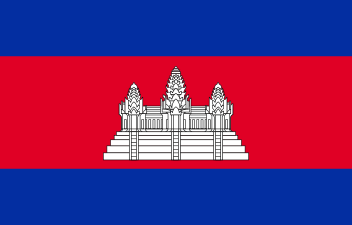 The air force's National Air Defense Command ("Kohanudnas") remained under the "ABRI" commander in chief. It had an essentially defensive function that included responsibility for the early warning system. The officer corps of the armed forces was estimated at 53,000 in 1992. Less than 1 percent of these were of general officer ranks. The Armed Forces Academy of the Republic of Indonesia ("AKABRI"), the national military academy at Magelang, Jawa Tengah Province trains most military officer corps. Other military academies are the Naval Academy ("A.A.L") in Surabaya and the Air Force Academy ("A.A.U") in Jogjakarta. Mandatory retirement exists for officers at the age of fifty-eight and routine periodic reassignments are enforced. After Soeharto's presidential era collapsed which was in 1998, the Indonesian Police Force was separated from the Armed Forces making the Indonesian Armed Forces under the direct auspices command of the Ministry of Defense and the Police Force under the direct auspices of the President of Indonesia. Before 1998, the Armed Forces of Indonesia (the then name "ABRI") was composed of four joint services which were the Indonesian Army, Indonesian Navy, Indonesian Air Force, and the Indonesian National Police. Then after 1998 (After reformation from Soeharto), the Armed Forces' name changed to TNI (Tentara Nasional Indonesia) literally meaning: "The National Military of Indonesia" and the independent Indonesian Police Force changed its name to POLRI (Polisi Republik Indonesia) literally meaning: "The National Police Force of Indonesia". Now specifically, although the Armed Forces of Indonesia and the National Police of Indonesia has been separated, they still cooperate and conduct special duties and tasks together for the sake of the national security and integrity of Indonesia. 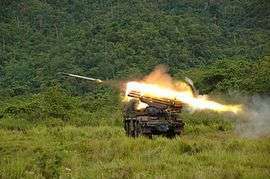 Indonesian RM-70 MLRS firing. The army currently operates seven of the type. The Indonesian Army was first formed in 1945 following the end of World War II and to protect the newly proclamated country, it initially consisted of local militia and grew to become the regular army of today. The force is now capable and has personnel up-to 306,506 and compromises of major and strong territorial army commands known as "Kodam" and several units, regiments, and battalions all stationed and tasked for the national army defense of Indonesia. The army is also built up of operational commands and special forces such as the: Kopassus and the Kostrad units also with other types of formation within the Army itself. In the other hand, The Indonesian Army also has duties for international border security and patrol operations. Such border security forces are too conduct such security and defense for the international borders of and from the country. The force is known as Pasukan Pengamanan Perbatasan (Border Security Troops) which are usually troops formed from various Indonesian Army Infantry Battalions or Units who are given the tasks to guard and patrol the borders in a distinctive period of time. It guards Indonesia's border with Malaysia, Papua New Guinea, and East Timor. The Indonesian Navy was first formed on 22 August 1945, it became the second country (after Thailand/Siam) in South East Asia to acquire a naval capability. The Current strength of the Indonesian Navy is around up-to 74,000. In contrast to many other nations and military traditions, the Navy uses Infantry style ranks (See: Indonesian military ranks). 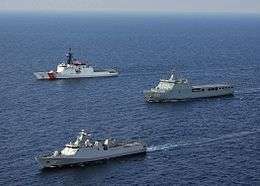 The Indonesian Navy has two major navy fleets which are the Western Fleet ("Koarmabar") based in Jakarta and the Eastern Fleet ("Koarmatim") based in Surabaya, both holding responsibility for the defense of the two maritime and naval territorial commands. In the other hand, the Indonesian Navy also has a management of aircraft and aviation systems which are operated by the Indonesian Naval Aviation Service ("Dinas Penerbangan TNI-AL"). The Indonesian Navy has also purchased 8 Mi-2 (now based in Surabaya), but only two have arrived because of problems with the Indonesian Navy's bureaucracy. The Navy operates 52 fixed wing aircraft and 23 combat and transport helicopters. 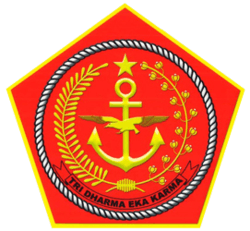 The Indonesian Navy also includes the Indonesian Marine Corps ("Korps Marinir", or "KorMar"). It was created on 15 November 1945 and has the duties of being the main naval infantry and amphibious warfare force with quick reaction capabilities and special operations abilities. The Indonesian Air Force is headquartered in Jakarta, Indonesia. Its Order of Battle is split into two Air Force Operational Commands ("KOOPSAU") (east and west regions). Most of its airbases are located on the island of Java. In addition, the Air Force also manages the National Air Defence Command ("KOHANUDNAS"), in terms that its commander is always an Air Force two-star Marshal; however, its operational command falls directly under the Commander of TNI (due to the fact that the Command's subordinate units come from all TNI services which have air defense capabilities). In 1946, Indonesia became the second country (after Thailand/Siam) in South East Asia to acquire an Air Force capability, with the formation of the Indonesian Air Force. 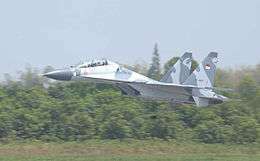 Presently, the Indonesian Air Force has up-to 34,930 personnel equipped with 510 aircraft including Su-27s, Su-30 fighters, A-4E Skyhawks, Northrop F-5s, F-16, KAI T-50 Golden Eagle. The Indonesian Air Force also has a formation of special operation forces which is known as Paskhas that are tasked for Infantry-like purposes and special quick reaction capabilities. While not strictly part of the armed forces (Military), the Indonesian National Police ("POLRI") often operate in paramilitary roles independently or in co-operation with the other services on internal security missions usually in cooperation with the Indonesian Armed Forces (TNI). The Indonesian Police Force's Mobile Brigade corps are the main paramilitary forces which are usually put on to these roles and tasks with the armed forces. Until this day, the "TNI" and the Indonesian Police Force "POLRI" still holds strong ties and cooperation for the sake of the nation's security and integrity purposes. Gen. Suharto June 1968 – March 1973 Position known as Commander of the Armed Forces of the Republic of Indonesia (Panglima ABRI) as well as Minister of Defence and Security; Note that Suharto was concurrently serving as the President. Adm. Agus Suhartono Since 28 September 2010 – 30 August 2013 Second Navy officer appointed. 1 2 International Institute for Strategic Studies (3 Feb 2014). The Military Balance 2014. London: Routledge. pp. 246–250. ISBN 9781857437225. ↑ "Ongoing Operations". www.pkc-indonesia.mil.id. Pusat Misi Pemeliharaan Perdamaian Tentara Nasional Indonesia. Retrieved 8 January 2014. 1 2 "SBY maintains status quo in 2015 budget". 18 August 2014. ↑ "Kejayaan Angkatan Perang Indonesia Pada Masa Bung Karno". Berdikari Online. Retrieved 27 October 2015. ↑ Garuda Militer. "15 Prajurit TNI Ikuti Farewell Ceremony di Haiti". garudamiliter.blogspot.com. Retrieved 27 October 2015. ↑ "Indonesia's elite soldiers kill prisoners". Al Jazeera. 5 April 2013. Retrieved 5 April 2013. ↑ Library of Congress Country Study, Indonesia, 1992, link verified December 2009. ↑ Colonel Sulistiyanto, M.Sc. "Strategic position in TNI". Indonesian Navy. Retrieved 30 April 2014. ↑ "Scramble Magazine: Indonesian Air Arms Overview". Scramble.nl. Retrieved 25 November 2011. ↑ Mark Beeson and Alex J. Bellamy, 'Securing Southeast Asia: The politics of security sector reform,' Routledge, 2008, ISBN 0-415-41619-1, 134-5. ↑ Beeson and Bellamy, 2008, 138. ↑ IDB. "Rp. 81.8 Triliun Anggaran Militer 2013 Indonesia". indo-defense.blogspot.com. Retrieved 27 October 2015. ↑ NurW. "DEFENSE STUDIES". defense-studies.blogspot.com. Retrieved 27 October 2015. ↑ "Komisi I Dukung Tambahan Anggaran Kemenhan Dan TNI". 21 October 2013. 1 2 3 4 5 6 Archived 9 October 2007 at the Wayback Machine. ↑ Rinaldo (30 August 2013). "Presiden SBY Lantik Panglima TNI dan KSAD Pagi Ini". liputan6dotcom. Retrieved 30 August 2013. Wikimedia Commons has media related to Military of Indonesia. Bresnan, John. (1993). Managing Indonesia: the modern political economy. New York: Columbia University Press. Many topics, including the political role of the military at the height of Suharto's New Order. Chandra, Siddharth and Douglas Kammen. (2002). "Generating Reforms and Reforming Generations: Military Politics in Indonesia's Transition to Democracy." World Politics, Vol. 55, No. 1. Crouch, Harold. (1988). The army and politics in Indonesia. Ithaca:Cornell University Press. Kammen, Douglas and Siddharth Chandra. (1999). A Tour of Duty: Changing Patterns of Military Politics in Indonesia in the 1990s. Ithaca, New York: Cornell Modern Indonesia Project No. 75.